Locate Business Owners In One Minute Or Less! I have a secret that I�m about to tell you that will prompt you to forward this email to at least five of your co-workers. If you are willing to play along then I encourage you to cc me on your email send, ok? 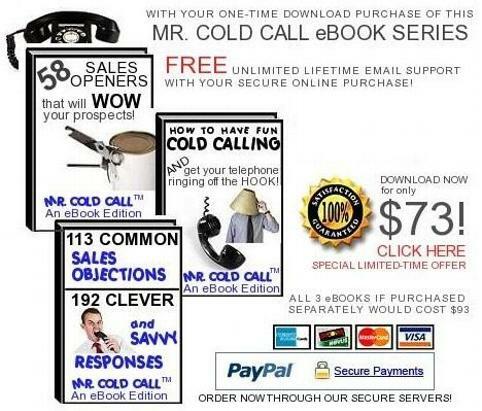 (My email address is seminars@mrcoldcall.com). You will be amazed once I show you this FREE business resource. What is my secret to locating the name of a business owner? In every state there is a governmental arm called the "Division of Corporations (DOC)." The DOC is a central location for the filing of business entities, trade and service marks, judgment liens, and fictitious name registrations. You can access this information online through your state�s DOC website. This searchable database allows you to look up the owners of businesses that are licensed in your state (in some states they might charge you a small fee to do an "extended search," however most states provide this service for FREE). When the term "Registered Agent" is used it can refer to the business owner or the attorney who did the filing on behalf of the business owner. If there is a "PA" next to the person�s name this will give you an indication if it was filed by an attorney. Or, if the "Registered Agent�s" address doesn�t match the business address then it�s most likely an attorney.